Roasted Fingerling Potatoes | Time to Cook! Roasted fingerling potatoes are so easy and yummy and they go with so many things – hamburgers, lamb chops, grilled steak, pork tenderloin, chicken, fish, etc. Enjoy! Pre-heat oven to 450 degrees. Rinse potatoes and pat them dry. Cut potatoes into halves or thirds, so that they are all roughly the same size. Place them onto a rimmed baking sheet and toss with the olive oil, rosemary, and a good sprinkle of salt and pepper. Roast them in the oven (tossing halfway through) for about 20-25 minutes or until nicely browned. The skins should appear a bit wrinkled and crispy. Sprinkle with additional rosemary and salt if desired. 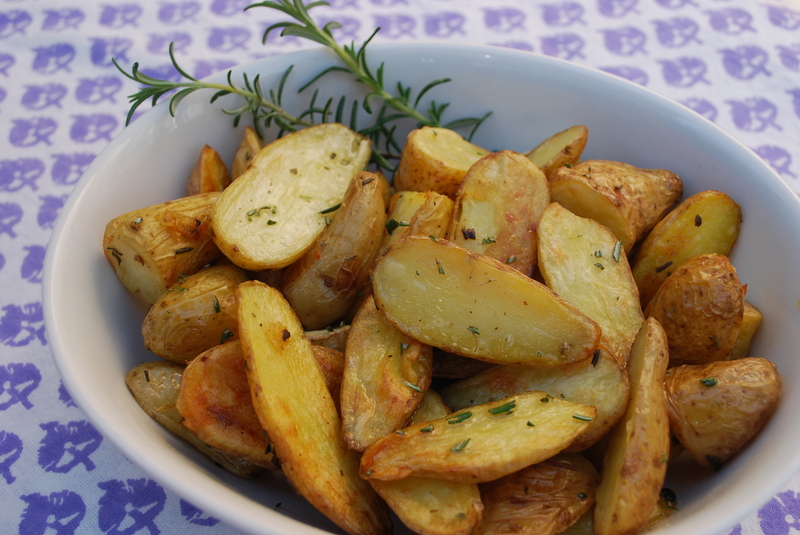 You can also toss potatoes in a bowl with lemon zest and lemon juice if desired. Serve immediately.